Posts about this translation of a man’s adventurous 1883 trip on horseback through Yellowstone Park. Just want to let everyone know that I would be happy to visit with my readers in the lobby of Old Faithful Inn between 11:00 am and 5:00 pm on Sunday, August 10th. I’ll be sitting at a table to the right of the front door and would love to sign your books and talk to you about the park. This applies to both my guidebook “Yellowstone Treasures” (Fourth edition) and the 1886 travelogue “Yellowstone, Land of Wonders” I helped translate from the French and annotate with colleague Suzanne Cane. Both books came out last year. Please stop in on your way to enjoy the geysers, whether you already own the books or would like to buy one from the gift shop in the Inn! More about the book signing on our Author Events page. A very responsive audience, essentially all of whom indicated they had visited Yellowstone some time in their lives, listened to Suzanne Cane and me this past Monday at the Bill Lane Center. We read them some of our translations of Jules Leclercq’s well-crafted paragraphs and showed engravings from his 1886 book, La Terre des Merveilles, and contemporary photos of Yellowstone scenes. The crater of Old Faithful is already covered with hundreds of names carved by visitors on the smooth surface of the rock. In a few hours the inscriptions are covered with a siliceous coating, which preserves the most insignificant names. The crude hand of vandals does not stop there; it is truly revolting to see them taking the brutal ax to the fragile and delicate concretions under the pretext of searching for specimens of geyserite. In building these admirable monuments, in artistically fashioning them, in sculpting and ornamenting them, nature has employed a slowness, a meticulousness, a patience of which men would not be capable, and it takes but one minute for irreverent hands to disfigure the work of thousands of years. There are few craters that have not been damaged by ax and spade, and, if care is not taken, they will gradually crumble to pieces under the attacks of these ruthless destroyers. It is the duty of the American government to halt these devastations, to prevent the criminal profanations of a sanctuary wherein no mortal should enter without a religious feeling of respect. Have you ever wondered what it was like to travel through the U.S. when railroad trains had newly opened up the whole country? Do you enjoy travelogues by fluent observers in the graceful cadences of the nineteenth century? Would you be curious as to what you could see and do when you rode horseback along crude trails before smooth asphalt roads opened the park to automobiles? The intrepid Belgian travel writer Jules Leclercq wrote a book about his 1883 trip that answered those questions and many more: La Terre des Merveilles: Promenade au parc national de l’Amérique du Nord. Unfortunately, this delightful travel account was never published in English until now. The University of Nebraska Press is bringing out the annotated translation that my colleague Suzanne Cane and I have made of Leclercq’s book, calling it Yellowstone, Land of Wonders. We have just learned that the publication date will be May 1, 2013, and, of course, we’re excited to be able to see our work of six or seven years come to fruition. Upon our return to the camp, night was falling. As we had eaten nothing since eight o’clock in the morning, I will let you wonder whether we did justice to the elk roast we were served in the tent, by the light of a candle stuck in the neck of a bottle. If, in Clarke’s opinion, the coffee was not as good as that which we had so often happily savored in Iceland, to compensate, the icy water drawn from the nearby river was excellent. After this copious repast we fraternized with a caravan of American travelers who had just arrived from the south; among them was an intrepid horsewoman. We made a circle in the open air around a large campfire fed by whole pine trees. While we were conversing around the merry flames, our friend Alexander sent us distant echoes of Mendelssohn’s Wedding March from deep in the woods, played on a perfectly portable little concertina that is the companion of all his travels. It was doubtless the first time that these lonely wilds had resounded with such harmonious chords. This music in the bosom of the wilderness plunged me into a delicious reverie. No other evening has engraved itself more profoundly on my memory. Never had stars seemed to me to shine with such vivid brilliance: one might have said countless golden lamps dispersed in infinity. I have always been vividly impressed by the beauty of the nights in these high northern regions of the Rocky Mountains. The brilliance of the stars is due to the great clarity of the air at these elevations; the atmosphere is so dry that all you need do is pass your hand rapidly over a bison pelt to make electric sparks fly. Nights are cold, and in the month of August, frosty nights regularly follow blazingly hot days. . .
My best excuse for neglecting my blog this late fall  is that I’ve been working non-stop with my colleague Suzanne Cane to send off our new Yellowstone manuscript to a publisher. We’ve translated into English a French book called La Terre des Merveilles. 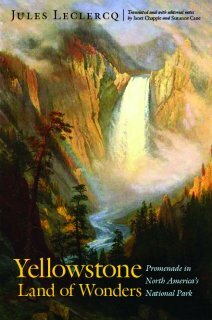 We’ve made the title into Yellowstone, Land of Wonders and brought it up to date with lots of explanatory notes. Our author, Jules Leclercq, was a Belgian attorney and judge, who spent his time away from the bench in traveling and writing excellent books about far-flung places. He went all over the world between the 1870s and the early 1900s: China, South Africa, Mexico, Iceland, remote islands, etc. Of course, his twenty-four travel books were all in French, although he clearly knew a lot of English. As far as we can determine, none of his travel books has ever before been fully translated in English. Suzanne and I loved his style: well-informed but often humorous, observant of details but never bogged down in them, respectful of his surroundings and his companions if sometimes gently mocking of himself or his situation. His Yellowstone visit was in 1883, but he showed great sensitivity to his environment and was appalled at the vandalism to park features he sometimes observed. We’ve tried to make the English version reflect Leclercq’s typical late-19th-century way of writing: using lots of similes and adjectives, flowery but always sticking to the subject. I found the book while researching for my Yellowstone anthology of early writings, working title “Magnificent Playground,” which as of now remains unpublished—but that’s another subject. 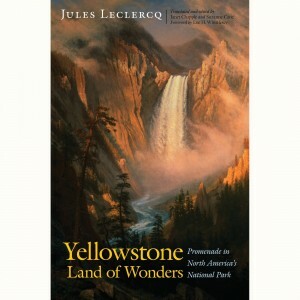 Yellowstone, Land of Wonders will be published by the University of Nebraska Press. Although our work on it is done except for the proofing, it is scheduled for publication in spring of 2013. We’ll just have to wait, but I think everyone with an interest in Yellowstone and western U.S. history will want to read it. Mute with amazement and astonishment, we gazed upon Grand Prismatic Spring, nature’s most gigantic hot spring. This expanse of steaming, sapphire-colored water is so surpassingly transparent that the thousand fantastical forms on the festooned walls could be distinguished under the crystal liquid. The aqueous layers take on a more and more intense blue color as the eye penetrates deeper into the abyss. Several meters from the edge one loses sight of the bottom of the basin, and the dark color of the water indicates unfathomable depths that are concealed from view. Toward the center of the basin, the water rises several inches high as it boils; agitated by an undulating motion, it regularly spills over from all sides above the reddish and curiously festooned siliceous ring that slightly protrudes around the basin. An extensive mist of hot vapors rises continually from the bosom of this marvelous expanse of water. Nary a bird glides above it; no tree grows on its banks. Words fail to describe the country surrounding it, sublime in its desolation and nakedness. And yet I need only close my eyes to see it again, for it is unforgettable. During recent weeks I’ve been concentrating all my efforts on two long-term writing projects. One job I’ve given myself this fall  is determining what changes I want to make in the upcoming reprint of Yellowstone Treasures. People do not always know that everything is constantly changing in the park, from realigned stretches of road to new geysers that pop up and old ones that change their behavior. My goal is to keep the guidebook as up-to-date as possible with almost-yearly reprints and new editions about every four years. The other time-consumer is polishing all the parts of another project I’ve been working on for about three years with a colleague. This one is a translation from the French of the account of a visit to Yellowstone in 1883 made by the prolific Belgian travel writer, Jules Leclercq. Getting this fascinating account published requires a lot of small changes to our manuscript in order to comply with the university press’s guidelines, along with preparing information to be used in promoting the book. It will be called Yellowstone, Land of Wonders: Promenade in North America’s National Park. But don’t hold your breath—it won’t be available for more than a year.